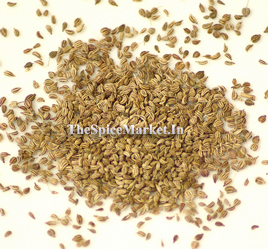 Ajwain, ajowan or carom is an annual herb in the family Apiaceae. It originated in the eastern Mediterranean, possibly Egypt, and spread up to India from the Near East. Both the leaves and the fruit pods (often mistakenly called seeds) of the plant are consumed by humans. The small fruit pods are pale brown and have an oval shape, resembling caraway and cumin. It has a bitter and pungent taste, with a flavor similar to anise and oregano. They smell almost exactly like thyme because it also contains thymol, but is more aromatic and less subtle in taste, as well as slightly bitter and pungent. Even a small amount of fruit pods tend to dominate the flavor of a dish. The plant is mainly cultivated in Iran and northern India. The fruit pods are rarely eaten raw; they are commonly dry-roasted or fried in ghee, clarified butter. This allows the spice to develop a more subtle and complex aroma. In Indian cuisine it is often part of a baghaar, a mixture of spices fried in oil or butter, which is used to flavor lentil dishes. It is considered to be an antiflatulent, a spice which reduces the gaseous effects of beans and other legumes. In Afghanistan the fruit pods are sprinkled over bread and biscuits.